Nintendo of America has announced that North American DSi owners will be able to upload photos to their Facebook accounts when the new system update goes live around 5PM pacific time. 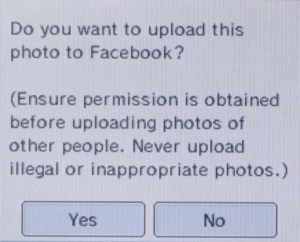 Lucky Americans will be able to tap a Facebook icon whilst perusing their photos and instantly send them to their Facebook profile, as if by magic. Euro and Japanese DSi owners were given this ability last week. Facebook and Nintendo DSi build on the trend of personalization that is so important to consumers. We're giving people the tools to express themselves in creative new ways and show off the results to their friends and family on Facebook. In the meantime, check out Pocket Gamer's excellent guide to uploading images to Facebook via the DSi. w00t! I'll be getting full use of this feature! Good,we got this update. Now I just need to get a DSi. "We're giving people the tools to express themselves in creative new ways and show off the results to their friends and family on Facebook." Yet you won't let people put pictures not from the DSi camera ON the DSi, nor will you let us personalize our DSi with good DSiWare games. It's pretty cookie cutter right now. Also what about video viewing? Email? voip? Hell, even customizing my DSi OS a little? Pretty pathetic personalization in my opinion. Is there anything else in ths system update? Nice update, but I do not use Facebook. @ E-160 Feraligatr: I'm serious. I would love to see a skype app. Voice chat would be so easy to implement. When I have to give up my iPhone when I go to china (don't want it stolen), I'm going to miss all the functional apps I have now. I hope they do bring some of those things to dsi! Not much, just a 'Camera Speed-up' and a blockout on all current DSi-ready flashcards. The thing about this update blocking flash cards is you might think "meh, they'll hack arround it anyway" or "they just won't update" but it is designed to stop botleggers mass producing fake DS games (these plauge eBay) as much as it is home users effectively doing the same. For now I'll take this and eagerly wait for more. Hmm, we beat Microsoft to the punch, and we can do it without spending money! This is amazing, i'm so happy. But does it remember the password? Good thing I brought my DSi to work today! @MDee14 I rather not have it remember the password, as it could be security risk. @TwilightV happy birthday yo! old enough to drink? wow, TwilightV, Nintendo is celebrating your birthday bigtime, we all have your birthday to than for the return of VC and Facebook functionality, did they mail you a Mario cake yet? EDIT: Happy birthday Starwolf! Do we get a piece of virtual cake? Wow, another hardy rant involving dsi, didn't see that coming. Anyway, as stated before this is a great start as I recently started a facebook account. Now if only NOA would take connectivity further. May I suggest Wii no Ma Channel? The Facebook functionality is awesome- I'm glad they finally did this. It takes a lot longer to upload them to a computer and then post. Thanks Nintendo! @anthonyb do you have the update? Thank you everyone! I wasn't able to get a DSi (finances, amiright? ), but I did get Wii Sports Resort. @Motang: I'm 20, but even still, soda is my drink! I don't see the update. Where is it?? @ballistikboy: The update goes out at 5:00pm pacific time. Ah, so another 30 min? Yay, Facebook...that's when you slam a book in somebody's face, right? Always a good feature. @Token Girl: I hear there's actually a Skype app under development. So um, am I going to get a pop up window or something? Or do I have to update it manually to check?...AND WHAT HAPPENED TO THE FORUMS?!?!!? did the forums die or something? I think it's quite nice; since it's a very simple way of tapping the Facebook icon in the DSi Camera menu! Also I didn't care about Facebook at all for a long time; but I guess it's also nice to have an account now... to stay in touch with my family & old high school friends! I also barely use my DSi camera; but I've already uploaded very few pictures of myself with the face alterations so far! I was amazed upon discovering this!